A Christmas fruit tree is a fun way to add something healthy to your holiday feast. When the holidays roll around. I love making my food look as good as it tastes! I love baking with my kids, and making cookies, and sweet treats, but I also love when I can make something pretty out of healthy foods too. It’s nice to have some healthy food break up all of the sugar that surrounds the holidays. 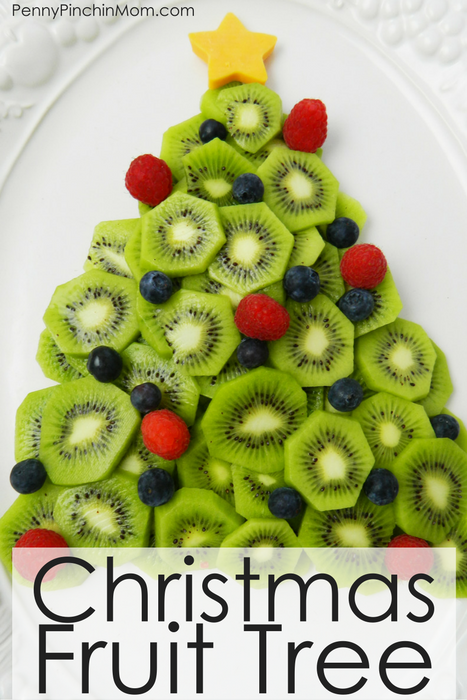 This Christmas Fruit Tree is perfect for any get together, or holiday party, and it’s so easy to make! Peel and slice your kiwis. As you do so, place them on the platter, forming the shape of a tree. Start at the bottom and work your way towards the top. Try to make each layer at least 3 – 4 kiwi deep. Next, place blueberries and raspberries “ornaments” on your tree. Don’t forget the star!! Use a small star cookie cutter, and cut out a star shape from a slice of cheddar cheese. If you have a different type of block cheese on hand, you can just use it to help keep the cost of the dish down. Once you’re finished arranging your platter just how you want it, you’re finished! You can serve immediately, or wrap with saran wrap or Glad Press N Seal and place in the fridge until you’re ready to serve! This is one treat that you won’t have leftovers from! « 5 Quart Professional Mixer for $199.99 Shipped!